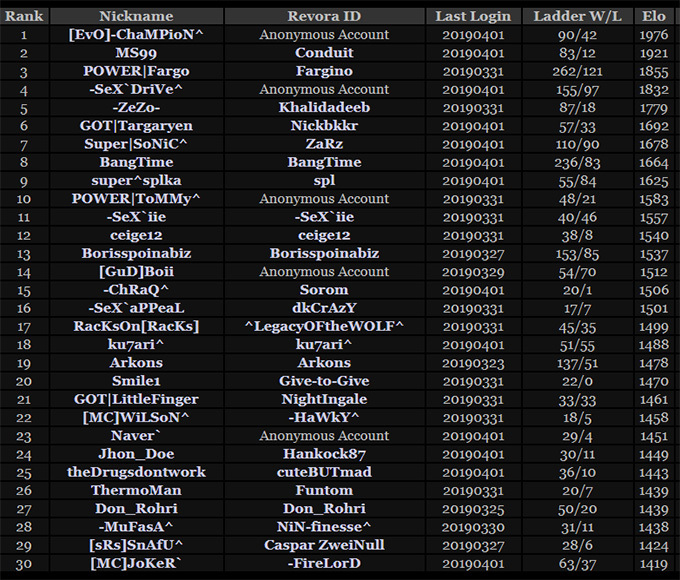 The ladders were reset on the 1st of March 2019 and these are the final ladders for April 2019, captured at 10:00am GMT of the 1st of April. Ladders Reset - March Ladder Finalists! of the Ladder March 2019! Successful participants in the Ladder Wars finals can expect an Award on their profile, as well as a place in the Ladder Hall of Fame. How does this work? How can I check in? If you played in the Ladder of March 2019 just say "I´m in! - I´m Rank #<Insert your rank here>". According to your rank number we will then match the 4 best Players against each other for the fight of the 1st, 2nd and 3rd place of the March 2019 Ladder. How long until the check in´s close? How many games need to be played? What armies? What maps? Who plays against who and when? We will have 2 Rounds. In the 1st Round Player 1 fights against Player 4. Player 2 fights against Player 3. In the 2nd Round the Winners of the 1st Round fight against each other for 1st and 2nd Place. The Loosers of the 1st Round fight against each other for the 3rd Place. Not really, played like 15 games. He was one of the players that made a cw account and seen the skill level was to high and couldn’t get 75 wins vs noobs and get top 5. Or like some other players got bored of the manual reporting. Or like some other players got bored of the manual reporting. I hope I am in a matchup with someone from USA because timezones are bastards and I don't want any stay up late or get up super early shenanigans. Probably taking breaks after spamming like maniacs. Bo5 maps and armies of your choice! What days do you want to schedule Dominator? I will probably have to play on my lunch break since our timezones are significantly different.